For many years people drew their water from the village pump on the green. But in 1912 the Willingham Water and General Supply Co. was established with money from wealthy local families. 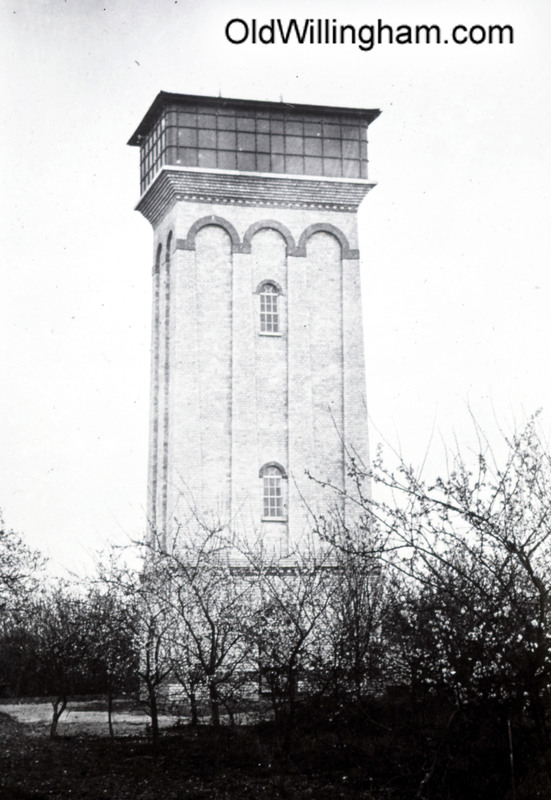 This huge water tower was built on Station Road filled by water pumped twice a day from a well below. There is still a row of terraced houses opposite the farm shop sometimes called “Tower Cottages” and the tower was located behind this. Initially, the water was delivered to stand pipes in the street and only later plumbed into houses. At 60ft the tower the tank provided good pressure locally but eventually, as the number of people using the water increased and the original pipes corroded the pressure could be very low on the far side of the village. As the supply system became modernized through electrical pumping, the tower was no longer needed and demolished in the 1950’s. Reputedly, the bricks were taken away by a farmer from Bluntisham to build a bungalow, load by load behind his tractor.